Two things that leap out at me from the newest Bharat story. First, the Filmcity move is because it was hard for Salman to get to set on time because of traffic. Really???? Because Amitabh always manages it! I think “traffic” should really read “because he is a star and doesn’t bother to get to set on time”. Oh, and he is working hard to prepare for the role, means he is working out a lot. Because he is trying to slim down so he can play an 18 year old. 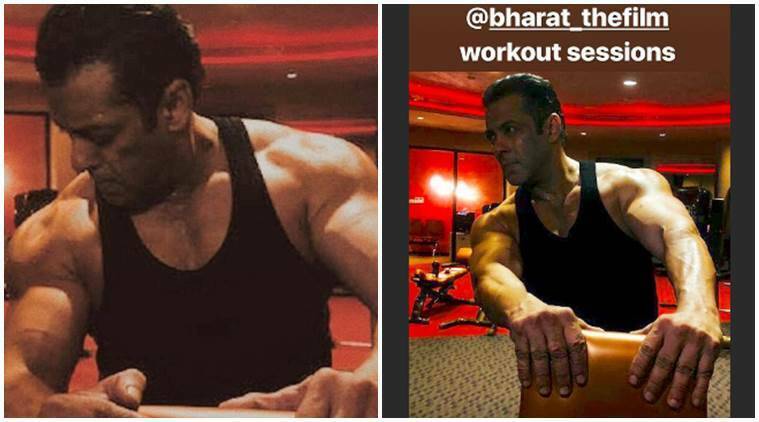 Salman, honey, I think it is time to accept that no matter how much you work out, you cannot TRAVEL BACK IN TIME. 52 to 18 does not compute! And his next film sound similarly delusional. Produced by his family, so he can do whatever, and another Korean remake, of a movie called “Veteran” about an experienced cop who finds his nemesis in a rich man criminal. This doesn’t sound exactly outside of Salman’s comfort zone, yet another hero cop film, despite all the physical things that make it hard for him to play hero cops any more. Oh, come to think of it, maybe this is Dabangg 3!!!! They are just stealing a plot from Korea and grafting it on to the existing series. Well, this is kind of sad. A fan tried to break into Akshay’s apartment, was promptly stopped by security and arrested. I’m not gonna say he shouldn’t have been stopped and arrested (Akshay does have kids, after all, they don’t need strangers wandering into their bedrooms), but it is kind of sad all the same, considering all those nice stories of fans who were welcomed in and helped by stars (story here). I hope we get more details at some point, but right now it sounds like the usual fan odyssey, he traveled to Bombay to meet Akshay, found out his address, loitered outside, and then (and here is where it changes) decided to try to break into the house. He shouldn’t have done that. But it’s kind of sad, considering all the many fans who travel and wait and hope, that he failed by going just a little bit too far than the rest. Rohit Shetty and Farah Khan Together!!!! Come to think of it, Farah came before Rohit. He made a straight mystery film, and then a straight comedy, and didn’t think to combine those two genres until after Farah released Main Hoon Na. Farah was also the one to first talk about wanting to make a straight “entertainer”, wanting to do a throwback to the 70s films with the kitsch and goofs. Rohit obviously is his own thing, but he and Farah really came up together with this new kind of genre. Anyway, I’m pumped! Farah gets to have some kind of support and collaboration, without losing her specific voice. This entry was posted in Uncategorized and tagged Akshay Kumar, Bharat, Farah Khan, Filmi News You Can Use, News Round-up, Salman Khan by mredlich21. Bookmark the permalink. I’m not sure I have your same sympathy for the Akshay Kumar intruder. Of course, I’m also picturing crazy Gaurav from Fan . . .
I’m also good with the new Farah-Rohit collaboration, but I’m a little annoyed that the optics are a bit sexist. Farah’s last two films weren’t mega hits and she needs a man to help guide her career going forward? I’m also just hoping that they just do “get” each other’s aesthetic, Rohit Shetty is building up his production house more, etc. More like the Kashyup/Rai collaborations then. You are right about the optics. Rohit’s produced and directed way more films, but then he’s had the opportunity to produce and direct way more films. And Farah’s MHN and OSO are far more successful than anything he has made. But if it turns into a true partnership, I am down for that. These little artist run production houses need to stick together if they want to compete in the market. In the most bizzare & unprecedented way,the producers of Arjun Reddy’s Tamil remake which was supposed to release this month-have announced that they are not happy with the film and are not releasing it. They are now going to reshoot the entire movie with a new director,crew and cast- except for the lead actor -Vikram’s son. The first director was the highly respected director Bala who made Vikram’s career. Like waste a fully shot movie & reshoot everything again? Who has this much money and what an insult to the director & crew. Yes! I read about it, but didn’t know it was supposed to release this month. How strange .. And How it’s possible they realized only now they don’t like the movie? Nobody was there when they were filming, editing etc? I thought I saw that story, but I thought I must not be reading it right and must be missing some subtle message of Tamil industry. So, I’m not missing anything? It is exactly what it sounds like, they are reshooting the whole thing? That is SO WEIRD!!! Agree about “who has that much money?” I’m gonna assume the push is coming from Vikram just because his son is the only artist retained. But I really would not think he would have enough push for this, hasn’t it been a while since he has had a big big hit film? Is he putting up all the money for this and how much money does he have anyway? Also, really makes me doubt the talent of his son. Feels like they might be blaming everyone else instead of where the real trouble is. I had recently watched a sequel to Vikram’s hit cop movie and it was all kinds of stupid and trashy. Something is not right with him if he chose that stupid movie and thinks the movie made by his mentor isn’t good enough for his son. His son looked strictly okay in the trailer.Of course noone is expecting him to ace over Vijay Devarakonda.Though he may not have had big hits,Vikram may have enough influence to bring about this kind of complete upheaval that’s never heard of before. Meanwhile Vikram’s Gautham Menon movie is back to “post-production” with no release date in sight. Although that could be more Gautham than Vikram. Perhaps Kangana has decided she wants to direct this one so they have to reshoot it. I wonder if Farah teamed up with Rohit because she hasn’t enough money to make a movie on her own. I also believe that she gels the best with Rohit…we will see. A lot of roumours already around…i.e. that she wants to launch Manushi Chillar. I can understand that fans go to a lot of extremes but that is nevertheless a no-go (like Gaurav in ShahRukh’s space). This film looks really cool. If it shows in Los Angeles it will be the first Malayalam film I see in a theater. This is the one that is a Sony co-production, I think the first Malayalam film to have an international co-producer. Which hopefully means it will have a wider release than Malayalam films usually get. It’s an unusual topic for an Indian film, right? Dystopian scifi isn’t what I think of as a topic for any of the industries. LOL so am I the only one who thought: OH NO! after reading about Farah-Rohit collaboration? I have always thought bollywood without thir movies would be a better place, and now they join hands? So we will have another expensive movie without plot but with a lot of exploding cars. One of my favorite genres, plotless with cars! I like it in American films too. But from your side of things, think of this as powers combined. Instead of two separate action/no plot films from Rohit and Farah, you will have only one film that is both of them together. If Farah is involved it will also have great choreography and shirtless men. All good by me! Yes, if Rohit Shetty has a flaw, it is his lack of shirtless men in his films. Thank goodness Farah can balance him! And Rohit can give her slightly more stripped down plotting. So th plot will be: shirtless men dancing and destroying cars. This is why The Transporter movies are the best films France has ever made. I loved Transporter and I wish Farah and Rohit made a movie like this. Oh and what do you think, maybe Farah (or the people who give her money to make movies) are affraid that th movie could be damaged because of Sajid problems, and that’s why they added Rohit’s name? I suspect it is something like that. Could also just be that Farah previously produced Sajid’s films, so it may have damaged her studio brand.